After Santa’s bag of toys breaks when trying to get down the chimney at Timmy’s house, a whole new bag of fun opens up for Rex and Timmy, giving them both a once-in-a-lifetime adventure and an opportunity to learn about the true meaning of Christmas. 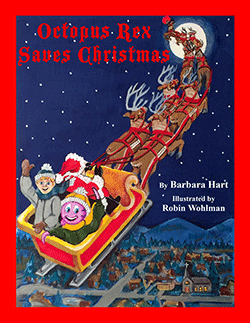 Octopus Rex Saves Christmas is the fourth installment in the Octopus Rex series by author and Grammy-nominated songwriter Barbara Hart. Hart has had a Rex Christmas story in mind ever since she started the series sixteen years ago. She believes every child who celebrates Christmas dreams what it would be like to see Santa in their living room delivering gifts on Christmas Eve.